Enova Volunteers Work with Big Brothers Big Sisters - Enova International, Inc. Through Enova Gives, many employees have found opportunities to give something back to the community. Whether that means taking advantage of a Volunteer Day or giving money through Enova’s Charitable Match Program, the variety of outreach options at Enova make it clear that volunteerism is a top priority. 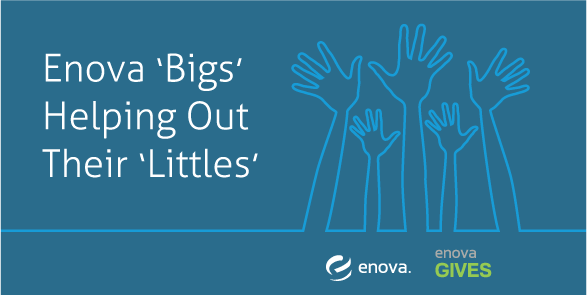 This spirit of service is what led Enova to team up with Chicago’s Little Village Boys & Girls Club, and to create a Big Brothers Big Sisters program that has been going strong for four years. Enova volunteers — or “Bigs” as they’re known to their “Littles” — meet from 4:30 to 6:00 every other Wednesday during the academic year, finding fun ways to interact with and educate their protégés. Though typically housed in Enova’s office space, these sessions have also included field trips to Chicago areas like the Millennium Park ice skating rink and the Lincoln Park Zoo. While these fun-focused events serve as the highlights, the real reward of working with Big Brothers Big Sisters is the opportunity to help steer these young people toward their goals, interests and passions.